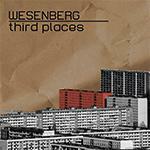 With the release of “Third Places” we welcome the highly prolific musician Krischan Jan-Eric Wesenberg on audiophob. To give an overview of his past works seems like a journey through more than 25 years of electronic music. Starting in the underground electro scene he released on such well known labels like Thee Black Label, Radikal Fear, Force Inc, Groove Attack, Unique, Play It Again Sam, Kalakuta Soul and Circus Company. Starting in 2003 he got more and more involved in quite a few now well known projects of the Dark Electro scene, including Rotersand, Straftanz, Config.Sys, Future Lied To Us and Radioaktivists. Furthermore his engagement can be heard in countless DJing, production, engineering, remixing, mastering and sound design works for a wide variety of clients and artists. “Third Places” evolves around a social concept defining the home as the first and work as the second place, while places of social interaction comprise as third places. Providing dark technoid and minimal sounds that sometimes drift into ambient or even acid, the album creates a club like atmosphere where the listener is welcomed as a regular, still able to get in touch with the new. The connection to the club as a third place is drawn by Wesenberg in choosing the names of music venues with a high relevance to his own work for most of the track titles.